We are there from the beginning. Contech offers vendor independent engineering and design services for new control system installations and migration projects. Our vendor independence allows us to evaluate the myriad of control system solutions available so we can provide the best fit for your greenfield or brownfield control system projects. 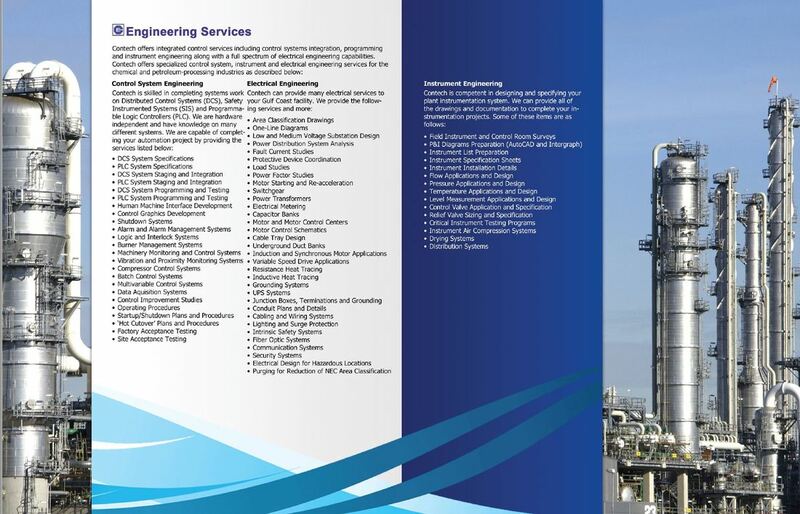 Our automation engineering services cover front end engineering, design, configuration, integration, commissioning, cutover and startup assistance. Control System Vendor Selection – Contech will assist in the selection of a new control system that fits the needs of the facility. During the selection process considerations for long-term support, ease of maintenance, plant knowledgebase and return on investment are taken into consideration to facilitate the selection process. System Engineering and Design – Contech provides engineering and design services to develop the facility’s Level 1 (Sensing and Manipulate) network to integration into the plant Level 4 (Business and Logistics) network. System engineering and design services include virtualization, network design, cybersecurity, infrastructure design and integration. HMI Development – Contech provides engineering services to implement high performance HMI graphics which maximize operator effectiveness and situational awareness. Contech can help develop plant HMI standards and style guides that will facilitate a standardized approach to your HMI. We will work with your operators and engineers to define performance requirements and identify the needs for your high performance graphics from the Level 1 performance oriented graphic to the lowest level 4 detail graphic. Our services include the full HMI lifecycle from standards development and toolkit development to display building, implementation and support. 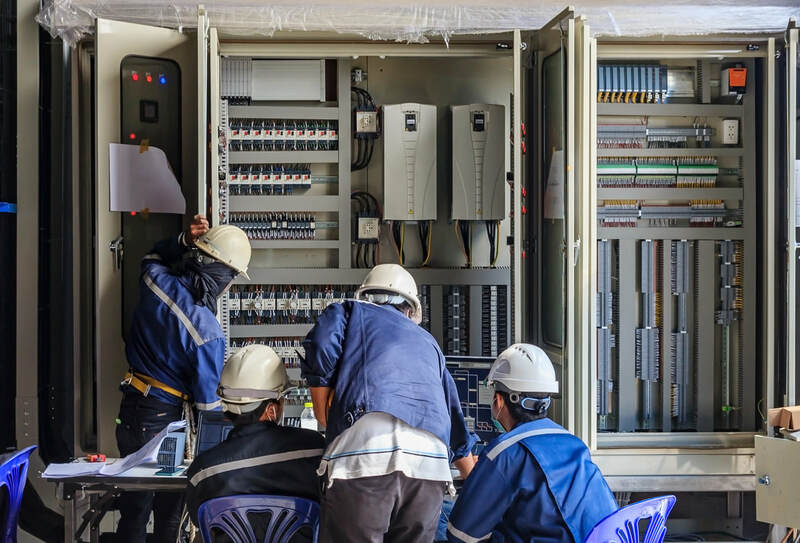 Process Control Configuration – Contech provides control configuration engineering services from small DCS modifications on existing control systems to large green-field and brown-field migration DCS systems. Contech has developed bulk-build tools to assist in the migration of existing control systems to the latest generation systems. Our services include control narrative development, alarm rationalization, configuration, implementation, cutover/commissioning and support. 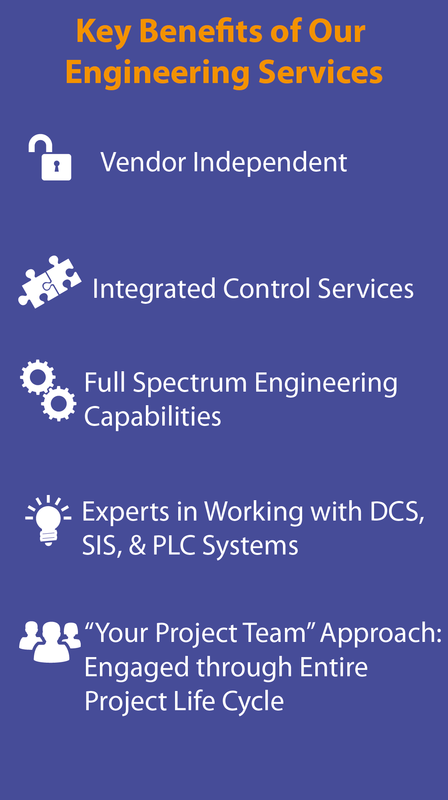 Contech Control Services offers a wide variety of Safety Instrumented Systems (SIS) services. 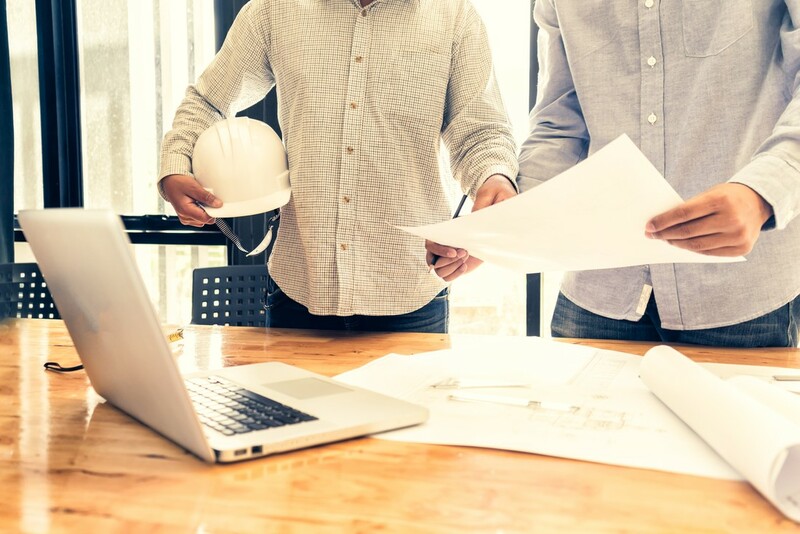 Our engineers and designers have experience in all project phases, including field surveys, FEED, early execution, detailed design, construction and maintenance. We have hands on experience specifying, configuring, troubleshooting, installing and commissioning at least 15 different SIS/PLC models. Engineers with field experience – Many of our engineers have followed projects from concept to startup, which has allowed them to understand all the ins and outs of the SIS from a hardware and software perspective. This real life experience has made our business adept at avoiding the pitfalls of bad specification and configuration practices. Vendor neutral integrator – Contech approaches any project with a mindset of helping the customer succeed. With a broad range of SIS experts, we have contributed to multiple SIS logic expansions and updates. Additionally, we have also engaged in integrating/moving/migrating SIS logic to different platforms. Experienced at SIS validation – Contech understands the difference a good FAT/SAT can have on a projects (perception and actual) success. Equipped with three staging areas at our facilities, our staff has mastered the simulation tools and techniques necessary to successfully implement testing procedures and have a smooth FAT/SAT. Additionally, we have experience using in house and third party software to further refine, speed up, and generally enhance testing results. As with the Analyzer Group and the DCS group, when it comes to Programmable Logic Control systems (PLC), Contech is a vendor independent automation and control engineering company that provides services and engineering for new installations and migration projects. Our vendor independence allows us to evaluate the existing control system solutions available so that we can properly engineer or, in some cases, reverse engineer the system in order to successfully modernize or migrate to the new system. Whether we are migrating the I/O of a PLC to a DCS or whether we are modernizing or migrating from one platform to another, our automation engineering services cover front end engineering, design, configuration, integration, commissioning, cutover and startup assistance. Project Sourcing – Contech will provide PLC engineers that are familiar with your existing and new control system/platform. HMI Development – Contech provides engineering services to implement high performance HMI graphics which maximize operator effectiveness and situational awareness. Contech can help develop plant HMI standards and style guides that will facilitate a standardized approach to your HMI. We will work with your operators and engineers to define performance requirements and identify the needs for your high performance graphics from the Level 1 performance oriented graphic to the lowest level 4 detailed graphic. Our services include the full HMI lifecycle from standards development and toolkit development to display building, implementation and support on all PLC projects. Process Control Configuration – Contech provides control configuration engineering services from small PLC modifications on existing control systems to larger Greenfield and Brownfield migration PLC systems. Contech has developed bulk-build tools to assist in the migration of existing control systems to the latest generation systems. Our services include control narrative development, alarm rationalization, configuration, implementation, cutover/commissioning and support.